Gil Evans contributed some charts to the sessions, acting as an advisor to a group of musicians who had met in his small New York apartment above a Chinese laundry. Evans had gained a reputation in the jazz world for his orchestration of bebop tunes for the Claude Thornhill orchestra, including Davis's "Donna Lee". Davis was seeking an alternative to the small groups typical of contemporary jazz (he was a member of Charlie Parker's quintet at the time), and in 1947 started to organize the loose circle of musicians into a working group. Rehearsals and experiments took place over the next year. The nonet performed live only briefly—initially for a two week engagement in late August and early September 1948 at the Royal Roost Club in New York. Billed as the "Miles Davis Band", the group at this time consisted of Davis (trumpet), Mike Zwerin (trombone), Bill Barber (tuba), Junior Collins (French horn), Gerry Mulligan (baritone saxophone), Lee Konitz (alto saxophone), John Lewis (piano), Al McKibbon (bass), and Max Roach (drums). Former Dizzy Gillespie vocalist Kenny Hagood was featured on a few songs. Unusually, the arrangers (Mulligan, Evans and Lewis) were given credit. The group returned to the Royal Roost later in September, and recordings from 4 September and 18 September 1948 were included on the 1998 Complete Birth of the Cool CD, alongside the later studio sides. There was a further short residency the following year at the Clique Club, but the nonet was not a financial success, and disbanded. In 1949 Davis had a contract with Capitol to record twelve sides for 78 rpm singles. He thus reformed the nonet to record three sessions in January and April 1949 and March 1950. Davis, Konitz, Mulligan and Barber were the only musicians who played on all three sessions, though the instrumental lineup was constant (excepting the omission of piano on a few songs). Originally released as singles, eight of the tracks were compiled in 1953 on a 10" vinyl record in Capitol's "Classics In Jazz" series (H-459), and Birth of the Cool was released in 1957 as a 12" LP that added the remaining three unreleased instrumental pieces ("Move", "Budo" and "Boplicity"). The final track, "Darn That Dream" (the only song with vocals, by Hagood), was included with the other eleven on a 1971 LP. Subsequent releases have been based on this last arrangement. 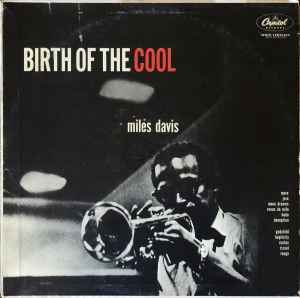 Musically, the songs on Birth of the Cool stand as an important reaction to the prominent bebop form in contemporary jazz. Though the break can be exaggerated—Charlie Parker participated in the discussions Evans led, most of the musicians were drawn from the bebop scene, and many continued to play in that style for years afterward—it inspired a whole school of jazz musicians, particularly in California in what is usually referred to as "West Coast jazz" or the "cool school". Good value for money! Sounds rich and it's pressed on heavy weight vinyl. Can't go wrong at this price! Jazz-rock? Oh no, no, no. It just is not. This was some decade before anyone had heard of rock'n'roll. I can not recommend this pressing. its absolutely ....rubbish. A flawless pressing! I really do enjoy to listen to it !!! Terrible pressing - small scratches, bumps, pops, etc. on all three of the copies I tried. According to cvinyl.com/labelguides/capitol.php this pressing would likely be the *first* according to the label....is there any further discussion about this somewhere? I am very pleased with Classic Records pressing and mastering of this great jazz compilation. I compared this Classic Records pressing with the recent LP version (likely from a digital master) and the RVG. The Classic is definitely superior. There is greater definition and air around the instruments, the drums sound real, and the music's details are a lot clearer too. Recommended. This is one RVG remaster that one can buy without reservation. Any review for this release? I'd like to know how this pressing sounds like.